This DXpedition was different from the others in many respects; it was short (just two days), the target was narrow (only stations from the United Kingdom) and the location was different. The participants were Mika Mäkeläinen and Jim Solatie. Jim is a pro in DXing UK stations, and he only had a few stations left to catch, while Mika had not done much serious DXing of the UK. Långåminne is located in Maalahti, south of the town of Vaasa, near the west coast of Finland. It's a five-hour drive from the capital Helsinki. This is one of the few areas in Finland, where most people speak Swedish as their native tongue. 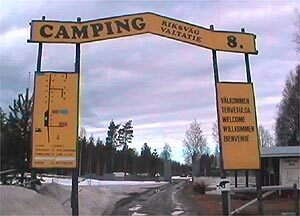 DXers in the area of Vaasa have long used a small cabin in a Långåminne camping area as their base. In winter the camping area is otherwise deserted and is free of any interference. The westerly location of Långåminne makes it an ideal location for catching stations from the Western hemisphere, especially UK, Spain and Latin America. Albeit short, the DXpedition was a success. Jim got what he wanted, a 1-watt hospital radio on 1575 kHz, and Mika logged about 20 UK stations which were new to him. Conditions on Friday, January 8th, were pretty neat, as UK stations came booming throughout the day and not just in the morning as usually. Here's the complete LÅ164 DXpedition log - and for more on the DXing hardware, check out our equipment.